Made of NASA-inspired materials, these pull-up wellness briefs absorb large amounts of urine to keep you dry and odor-free. With 8 hours of protection, you’ll get a good night’s sleep and feel confident during travel or social events with this absorbent underwear. Specify size: Medium (13"-30"), Large (30"-40"), XL (40"-60"), and 2XL (60"-80"). 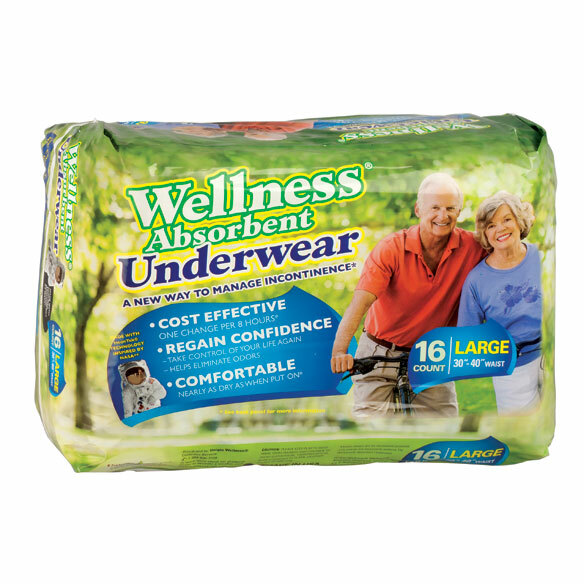 My family and I have tried just about every kind of wellness underwear available for my grandmother, who has dementia. This is the best we've found. 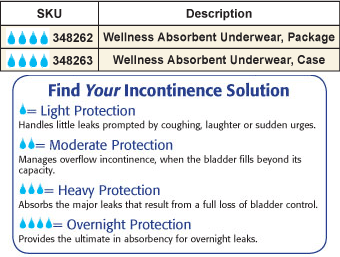 These don't leak at all for us, and they have the best absorbency we've found. 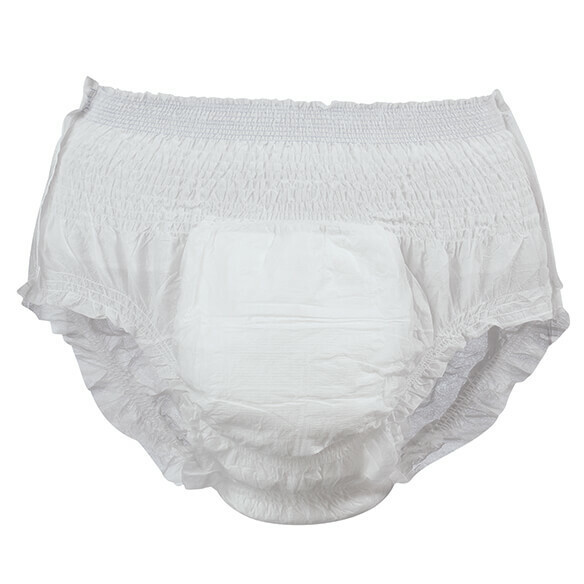 The briefs really do stay dry while absorbing liquid so if they aren't full we don't have to change grandma every time we take her to the bathroom. They have let me sleep more at night because I don't have to worry about leakage during the night. And, we make less garbage and it smells way less. Pretty much everything the manufacturers claim is true for us. For me these are the new gold standard for wellness briefs, and worth it to me because I get more sleep. because of the way they ares constructed, so I am very grateful for them. Works extremely well. Much better than another product available locally or at hospitals. accidents while using these More Absorbent Ones!! They are the most absorbetent I have used. Sorry I can't spell. I am 91 years old. They last the longest for protection of (8) hours. They work very well for my husband for overnight coverage. Because they last longer without leaks. The product work well for my mother's needs. These briefs are the most effective ones my husband has tried. They don't' leak over one night or over one day which is quite a feat, in my opinion. Very easy to put on and off. I do recommend them to anyone needing this kind of care. Best diaper that doesn't leak. My mother has tried the Depends product in the same size but were not comfortable for her. These are comfortable, soft and stretchable and absorbent. I wanted to try this one. They are fabulous. I no longer sleep in a puddle. They are so comfortable. I am 91 years young. Because they are more absorbent than other brands. They just plain feel good. I am providing them to my sister. The reviews were very good. and a previous sample that worked very well. Work well for long drives and activities where bathrooms are not easily accessible. this is a very good product, since I started order them. they protect me for a long time. this the best product I have came across. thank you. used them before. very good, price is right. To try and keep my husband dry so he can get a good nights sleep. It' a super soaker upper. BEST ANSWER: Thank you for your question. Size Medium comes with 72 to a case, the large comes with 64 to a case and the X-Large comes with 48 to a case. We hope this information will be of help to you. I order size large and there are 64 in a case. BEST ANSWER: Thank you for your question. 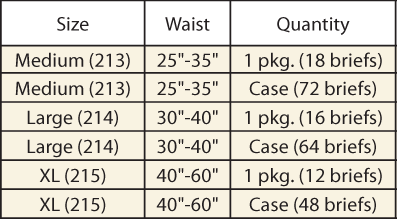 That depends on the size medium is 18 briefs for the package and 72 briefs for the case. Large is 16 briefs for the package and 64 briefs for the case. XL 12 briefs for the package and 48 briefs for the case. 2XL is 12 briefs for the package and 48 briefs for the case. We hope this information will be of help to you. how many ounces of urine is held in briefs/? BEST ANSWER: Thank you for your question. This item will hold up to 2,000mL or 67oz. We hope this information will be of help to you. BEST ANSWER: Thank you for your question. The Wellness Briefs come with 72 per case. We hope this information will be of help to you. depends on your waist size. I want to try one package befor I order cases How do I order 1 package? BEST ANSWER: Thank you for your question. The item number for the package is 348262. We hope this information will be of help to you.